Thyme for Cooking side dish, Soy-Balsamic Glazed Carrots. Soy sauce and Balsamic vinegar combine for a light glaze... And I always have carrots in my fridge in case of a vegetable emergency. 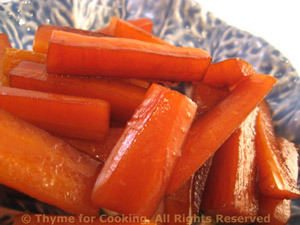 Peel carrots, cut in half, then each in half again so you have carrot sticks. Put carrots, water in a small skillet, cover and simmer until just tender, 10 - 12 minutes. When tender, drain all water. Add oil and sauté carrots until any remaining water has evaporated. Add vinegar and soy sauce and sauté, 2 - 3 minutes longer, until nicely glazed.